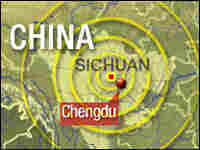 English Teacher's China Update Rebecca Stormer and her husband have been teaching English in Mianyang, China, about 30 miles away from the epicenter of Monday's quake. We check in with Stormer to see how recovery efforts are going four days after the disaster. Rebecca Stormer and her husband have been teaching English in Mianyang, China — about 30 miles from the epicenter of Monday's earthquake. An aftershock hit just as we spoke with Stormer on Tuesday. Now we check in with her again. 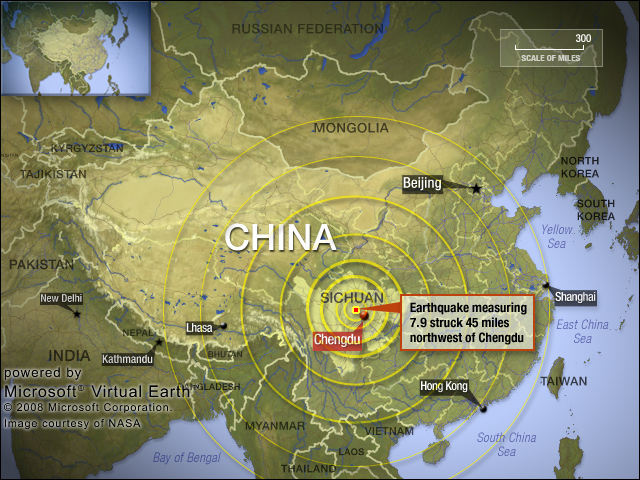 Hosts and producers of "All Things Considered" were in China when the earthquake hit. They report on its aftermath. The earthquake was felt as far away as Laos and Vietnam. More than 130,000 soldiers and police joined relief operations in earthquake-stricken southwest China on Thursday, as officials sent in more equipment to search for survivors. Chinese officials warned the death toll from this week's earthquake could soar to 50,000, and the government issued a public appeal for tools and equipment to help with the rescue. After initially refusing to admit foreign relief workers, China on Thursday said crews from Japan, Russia, South Korea and Singapore would be allowed into the country. The Chinese government said they will not give up the search for survivors, despite the decreasing chance of finding victims alive. 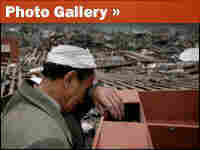 About 20,000 are confirmed dead after Monday's 7.9 magnitude quake, and at least 25,000 were buried beneath collapsed buildings, landslides and buckled roads, officials said. The Communist Party leadership ordered local officials to maintain social stability, and sent 90 more helicopters to transport supplies and army medics to isolated mountain areas. The official Xinhua News Agency said 17 "malicious rumourmongers" had been punished for spreading "false information, sensational statements and sapping public confidence." Premier Wen Jiabao flew by helicopter to Wenchuan county, the epicenter of the quake, to survey the damage. "The Communist Party has not forgotten this place," he assured residents. After three days, experts said, little time remains to save the thousands of people still trapped under debris. Officials deployed more helicopters into earthquake-stricken parts of southwest Sichuan province, where the quake killed around 15,000 people. Local media reported that not only residents but now rescue workers were having to be evacuated from parts of Mianyang city and other parts of Sichuan. The earthquake did major damage to some dams near the epicenter of the quake and also caused landslides that have blocked rivers.